Cardiac arrest, also known as cardiopulmonary arrest or circulatory arrest, is the cessation of normal circulation of the blood due to failure of the heart to contract effectively. Medical personnel may refer to an unexpected cardiac arrest as a sudden cardiac arrest (SCA). Arrested blood circulation prevents delivery of oxygen to the body. Lack of oxygen to the brain causes loss of consciousness, which then results in abnormal or absent breathing. Brain injury is likely to happen if cardiac arrest goes untreated for more than five minutes. For the best chance of survival and neurological recovery, immediate and decisive treatment is imperative. Cardiac arrest is a medical emergency that, in certain situations, is potentially reversible if treated early. Unexpected cardiac arrest can lead to death within minutes: this is called sudden cardiac death (SCD). 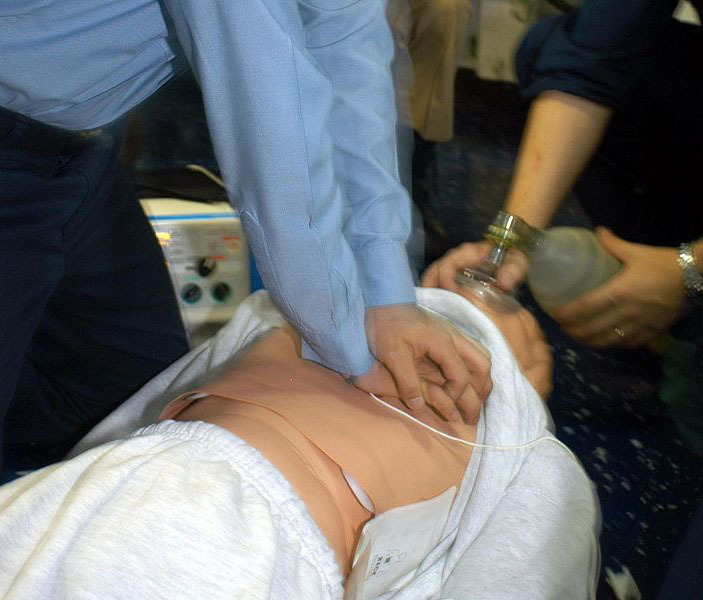 The treatment for cardiac arrest is immediate defibrillation if a "shockable" rhythm is present, while cardiopulmonary resuscitation (CPR) is used to provide circulatory support and/or to induce a "shockable" rhythm.